A DSLR user tries out "going small" with the Olympus OM-D E-M1. On a recent live-aboard trip to the Sea of Cortez, I had the misfortune of flooding my housing on the second dive of my trip. I was heartbroken at losing my favorite lens and a darn good DSLR camera body. At that very moment, I was looking at the next seven days of being on a live-aboard with twenty other camera-divers and I would not be taking any photos. As word of my camera flood went around the boat, our trip leader Jack offered to loan me a new Olympus OM-D E-M1 camera in an underwater housing. Pretty hard to turn down that kind of an offer! I was excited to get my hands on one these new micro four-thirds size cameras in such a robust housing. Divers and models make nice subjects to inspire wonder and excitement for the underwater environment. A human presence in this surreal, weightless surrounding can really draw your viewer in and help them relate to your image. If you are lucky enough to work with a cooperative dive model, try to prepare with the tips below. 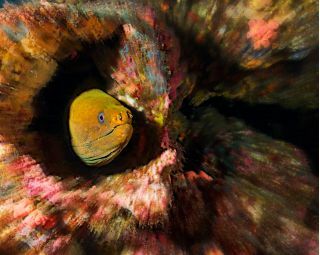 You can also use many of these tips to photograph unsuspecting divers. First thing – make sure your diver model has all their gear neat and secure. Longer hair should be tied back to keep it from obscuring the face or just flowing in odd ways. Make sure they keep their body and arms positioned properly. Mask selection is very important – if you get this option. Have your model or dive buddy wear a mask that is not too distracting, unflattering and does not make them look like an alien. The choice is a personal preference, choose what you think looks good. I do however suggest staying away from all black masks as they hide the nose and much of the face making the diver’s face look odd. While a black mask isn’t good – black fins are good. Fins really compliment the diver and darker color fins look better – more like an extension of the diver. Have a good communication system with your model before you get in the water. Even if your model is really your dive buddy and it is not their main concern to be your model – come up with a plan for hand signals to let them know when you would like them to pose for you & what type of positioning or movement you would like. Just about any wide-angle shot looks more intriguing with a diver silhouette in that big blue area. Diver silhouettes also look nice, create more interest and show scale when photographing a big animal in the distance or a shipwreck. Most of the time, especially when doing wide-angle photography; it’s best to stay away from crowds. But sometimes you have to compromise. If you are with a group on a dive, try looking at your fellow divers as additional subject matter – even if they are not your model or buddy. Sometimes you might get annoyed that they are in the way, but take that opportunity to change your position so that their presence might actually compliment your composition. Make sure your model or buddy has good buoyancy control – especially if you are planning on having them pose close to fragile corals. If they are not very skilled in this area – change your composition to have these fragile things in the foreground and your model behind, but further back so there is no risk of accidentally bumping into something. With this composition and the magnification of the water, they can be a couple feet way, but still look like they are close to the coral. Most people are intrigued by the notion of swimming next to a large animal underwater, especially if they never have. If you come across an animal like a turtle or something bigger, make sure that your model or buddy knows to position themselves on the other side of the animal if possible so that they can be in the background of your shot. Again, like the coral, your model doesn’t have to be right next to the animal in order to look like they are. Don’t forget about the possibility of your diver holding a light. This can be done just to draw attention to a diver silhouette – or the diver can provide additional light on the other subject of your composition. If you are instructing your model or dive buddy into your scene, make sure to have your camera setting all ready before they enter the shot. Composing photographs with people in them is best done with a wide angle lens… but not too wide. In most cases you will not want the distortion of a fish-eye on the human body. A lens in the 20-28mm range works really well. Go over your images with your model. Having them see what looks good and what doesn’t will really help them know what to do the next time around. Looking natural underwater – especially while holding your breath – is much harder than it looks. Before you shoot a model underwater, try holding your breath while swimming underwater with your eyes open, cheeks un-puffed and looking natural… moving freely, without fins. See what it is like, what the challenges are. This will make it easier to work with your model later and help you come up with some tricks and advice. Clothes – especially long flowing clothes can initially cause panic, as there is the feeling of being tangled and drowning. I find it helpful to explain this to new models right away before they start. If they are expecting it, it seems to prepare them and helps reduce the panic. If you can avoid this – avoid it. Try to find someone else who is more comfortable in the water. Many people seem to have this problem and it really is one of the most challenging obstacles to work with. If you have to work with someone like this, there are a few different things you can try. Have them practice holding their breath then just lowering their mouth and nose underwater so they can get the feeling of not drawing air into their nose while underwater – in a calm, relaxed way. If they just can’t get comfortable with it try having them blow a little air out of their nose when they are first going underwater – then hold their breath. If all else fails – let them hold their nose when they first go underwater – then let go while still holding their breath. If you absolutely have to work with someone like this – be prepared to spend much more time getting your shots and you may not be able to get exactly what you want. Photographing models – especially in a pool with chlorine, eyes will get irritated after a while. Some people are more sensitive, but just about everyone will be affected after a while, so keep that in mind. After the shoot, models can flush their eyes with a cool eye rinse or saline eye drops for relief. Fabric as well as constant motion causes water to get cloudy after a while. Fabric can release particles, so pre-wash it if possible. Constant motion causes tiny little bubbles that make the water look cloudy. If you are in a pool – taking a break for a while can help the bubbles dissipate. Don't forget, when you are photographing models, you don't always have to present the photo right-side-up. The weightless look of underwater shots gives you complete creative freedom. So, turn your photographs any way you want! Show your model examples – photos or sketches – of positioning before they get in the water. After they take some time to get used to being underwater, they will be able to picture the visuals in their head to help them figure out movements and poses. Before you start, let your model get used to moving around underwater. Have them practice for a while in a completely relaxed mode without any pressure to do anything specific. When using clothing & fabric – the model needs to be able to create movement and motion that gets the fabric moving properly. Or, if it’s more of a still situation you will need helpers to constantly adjust fabric. Small fishing weights can also be used – depending on the look you are going for. If you are in a pool, the model can always retreat to the edge, but if you are in open water – other precautions need to be taken. Keep some sort of float or platform close by. There should also be at least one helper with fins staying close by the model that can help. It’s really best to have at least 2 helpers ready with fins & mask when shooting in a pool. When shooting in open water divers are a better choice. Along with safety, they can wrangle fabric, adjust props and hold strategic lights. Composing photographs with people in them is best done with a wide angle lens… but not too wide. In most cases you will not want the distortion of a fish-eye on the human body. You will want to be able to get as close to your model as possible while still being able to get their whole body in frame. A lens in the 20-28mm range works really well. If the model will be working with you again, or if you take a break during the shoot, go over the images with your model. Having them see what looks good and what doesn’t will really help them know what to do the next time around. What it feels like they are doing – isn’t always really what they are doing.